Sometimes a person has so much charm that it oozes through a computer screen and split kicks you in the face. Someone who makes you smile even though you’ve never held a conversation. 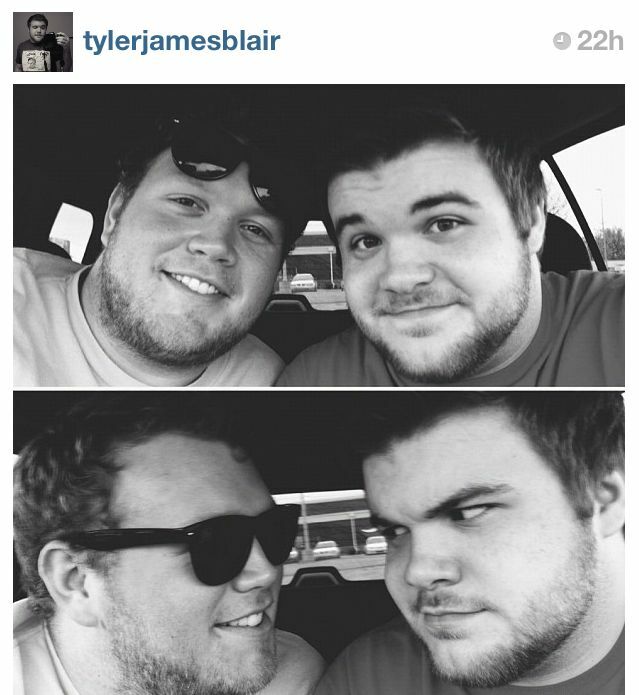 If I had to write my own dictionary I would define charming as Tyler James Blair. You may recognize him from a couple GIFs I posted a week or two ago. I first stumbled upon him on Instagram. He loves to take pictures of everything around him but by far his favorite subject is his boyfriend BJ. A genuinely adorable couple that just might make me believe in love again. My school-girl crush on him is very innocent. Don’t get crazy… I’m not trying to break up his relationship or anything. I just wanted to share his cuteness with the world. He has a face that will melt even the darkest of hearts. For the longest time I was a fan just from his photos. Now his videos have sealed by membership in his fan club. Can you imagine if he was singing this song to you? He’s on his way to becoming something of an (gay) internet sensation. He even made it onto Jason Pepping’s exclusive sketch list. I challenge you to watch this video and not smile. If you want to see more of him check out one of his many profiles. I recommend Instagram because the photos are updated the most frequently.